A bit overdue but a quick look back on a very successful competition, the Bedford World Challenge 2015. It was the 10th anniversary with again a record number of registered teams. Thunder ISR was looking forward to it very much, being just back from a training camp in Eloy. We were curious where we stand against the competition. And that’s exactly our point, the Bedford World Challenge is all about competition. There are so many teams at all levels that everybody is bound to be in some kind of competition with other teams, and that applies for all categories. We had our good bunch of rivals: Gravoche, SportLoto, Weembi Lille, SDC Rhythm XP. We believe we’ve come so close to the top, we consider ourselves part of the top. Nice place to be for a bunch of weekend warriors. 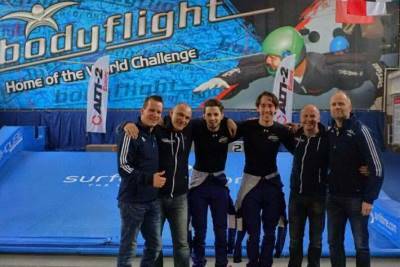 Thunder ISR has always been proud to represent Belgium, we were excited to see so many other Belgian teams participating as well: Hayabusa, Les Stunts, Team Rudy, Jetmax, There were also two teams in Dynamic with Belgian nationals in them: Dynamight and Airspace. In total Belgian was represented by 7 teams. In contrast however we actually felt disappointed that the Netherlands was hardly represented, apart from ISR Freefly with Joey and Rick in the Dynamic category. 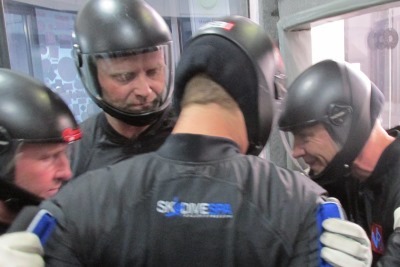 It was great to see Joey and Rick experience their first ever competition. They’ve done really well, learned a great deal about actually competing, and learned from the top teams. They had loads of fun with them as well. Thunder ISR would like it very much if in next year’s edition of the World Challenge a whole bunch of Dutch teams will compete as well. The Thunder ISR tunnel camps are a great way to prepare for such competitions. We arrived two days early to train 1 hour and 45 minutes to get used to the tunnel. It’s always good to spend some time in any tunnel prior to the competition to get used to it as none of the tunnels are alike. Our training sessions went really well, we really didn’t have any problem blocks and felt comfortable with all our exits (or entries?). The format of the competition was changed this year. Triple-A started in the morning, did 5 rounds and was done my 14:00. Great to not have to spend a full day in the tunnel for just 5 rounds. Well, we still stayed in the tunnel, and had a lot of time for beers. Man, hard to keep up with the Brits. Our first competition day went really well, we tied on 3rd place with two other teams, mainly as we rocked round 5. Great starting point to drink some beers from 14:00. The second day we started with a good round, at least that’s how we experienced it. Just our rivals did better. Round 7 we took a bit of a risk, 5 N L G, we took the Z-L to G combination. Worked really well in A-slot, but B-slot was quite difficult, no major problems, but it took the speed and rhythm out of our jump. Those two rounds we got beat up quite a lot by our competition. The next three rounds though we did really well. Third place seemed out of reach, but at least we were determined to beat our Russian longtime rivals/friends. We beat them outdoor at the World Cup in 2012, but in the tunnel they kept winning from us. It came to the last round to do it, after round nine we were 2 points behind. Our last round went really great so we were dependent on the performance of the Russians. It took however hours and hours, and beers and beers, to wait until the scoring of the last 6 Triple-A teams was shown. We indeed did really great. Our opponents however had quite a bad round, we outscored them in round 10 with 5 points. We ended up 5th, not bad for a bunch of weekend warriors. By the way, great performance of to the Belgian teams, many podium places, really proud. 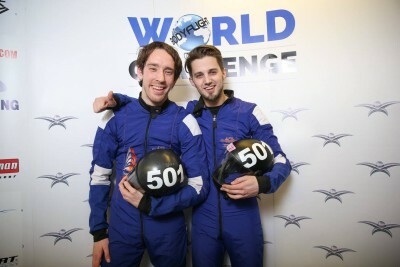 Team Rudy and Jetmax winning medals at their first international competition. A special congrats to Hayabusa, winning again, but now in the new line-up, great job Bob. The party was really great. Starting with our Russian friends drinking some beers. Further a great band, loads of fireworks, and obviously many more beers. We had great fun. The World Challenge 2016 is already in our calendars, a podium place should be in reach by that time. We already booked our tunnel training in Bedford for next year. We really hope that from both Belgium and Holland a lot of teams will join as well. Don’t hesitate asking us to convince you to join. Many thanks to the organizers for yet again a perfectly organised World Challenge. Also a special thanks to Kurt Gaebel for his continuous enthusiasm towards the teams and the reporting to the many followers. 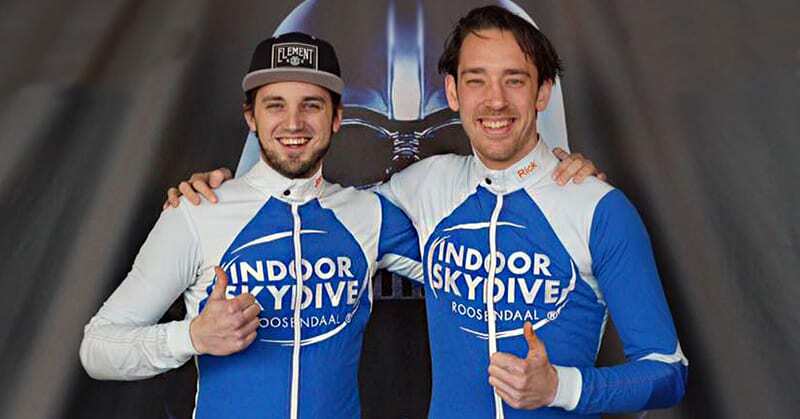 Thanks to all our sponsors and supporters for enabling us to achieve the level where we’re at: Indoor Skydive Roosendaal, United Parachute Technologies, Performance Designs, Vigil, Skydive Spa, Cookie, Larsen & Brusgaard. Next for us, next to our weekly tunnel training and tunnel camps, is 8way training with Hayabusa. Looking forward to it very much. Let’s see what we can do. We’ll keep you posted. And again, need tunnel coaching? Thunder ISR can help you out. 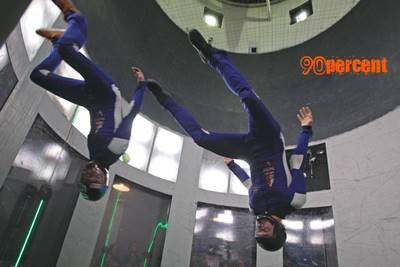 Join our tunnel camps at Indoor Skydive Roosendaal. Contact Paul Hofstee at phofstee@hotmail.com.